100 Electric Cars are planned to use V2G in 2011 – advancing smart grid charging and storage. The University of Delaware has signed the first license for its vehicle-to-grid (V2G) technology with AutoPort, Inc., a major vehicle processing and modification facility in New Castle, Del. 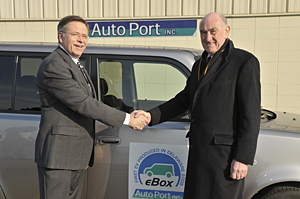 Under the terms of the licensing agreement, AutoPort has been granted non-exclusive rights in the area of commercial fleet vehicles. The licensing agreement launches the first large-scale demonstration of the UD-developed V2G technology, which enables electric car owners to plug in their vehicles and send electricity back to electrical utilities. The system is designed to generate cash for the driver, while strengthening the nation’s power supply and reducing dependence on fossil fuels. The UD agreement with Autoport stands to benefit not only the owners of electric cars, but also the regional economy, and the University, which will get R&D experience as the technology goes into real-world use. If the initial test is successful, and V2G vehicles are subsequently manufactured, the University would receive a royalty for each vehicle sold with V2G equipment. During the next year, AutoPort plans to retrofit the first 100 V2G cars as a proof-of-concept demonstration of the technology, which was developed by Willett Kempton, a professor in UD’s College of Earth, Ocean, and Environment, and UD research fellow Jasna Tomic. AC Propulsion, based in San Dimas, Calif., makes the electric drive system and designed the eBox, an all-electric car. They have added V2G features as a result of working with UD researchers. Johnson said that AutoPort will work with major companies in the area to demonstrate the V2G concept. A minimum of 60 vehicles is needed to produce one megawatt of power when the vehicles are plugged into the grid. The company currently is completing four vehicles for the State of Delaware and expects to have the first 100 vehicles produced in the next 12 to 18 months, Johnson noted. Although the first vehicle conversions have been to Toyota Scions, Johnson said that other car models are being considered, and the company is approaching some of their large-fleet customers about converting their three- to five-year-old Chevrolet vans. “This has great appeal to them because we are extending the useful life of a fully depreciated asset and making it into a maintenance-free revenue-producing vehicle on the grid,” Johnson said. In September 2009, Delaware Gov. Jack Markell signed Senate Bill 153, which rewards owners of V2G technology for plugging into the grid, compensating them for electricity sent back to the grid at the same rate they pay for electricity to charge their car battery. A bill introduced in Congress in December 2009 would provide funding to the Department of Energy and U.S. Postal Service to convert existing mail trucks and manufacture new ones to use the UD-developed V2G technology. “We’re at the cusp of a potential new industry,” said Bradley Yops, assistant director of the Intellectual Property Center in the Office of Economic Innovation and Partnerships, and lead negotiator of the license agreement. For additional V2G licensing opportunities, contact UD’s Office of Economic Innovation and Partnerships at [oeip-info@udel.edu] or (302) 731-7140.